Students will be able to tackle open-ended questions about how to approach division problems with a divisor of five and an unknown quotient. They will use a scientific structure to model with mathematics and make sense of abstract problems. UPDATED 7/25/15. Patterns in division and multiplication can be found in nature, and an understanding of these patterns enables scientists to conduct systematic research. If you live in a forested place, have students imagine standing under a tree on a sunny day. Then have them imagine climbing a tree. Finally, ask them to picture what the tree looks like in the winter. The point here is for the students to make a personal connection to the tree prior to learning that even one group of trees (for example the genus Acer a/k/a maple) can have more than 40 different insects that depend upon it in some way. If you live far from a forest, as do my little Tucson students, I've included a short slideshow with images of many different tree species. It was taken at an arboretum! and this Math with Maples activity to facilitate student discussion division in a scientific context. 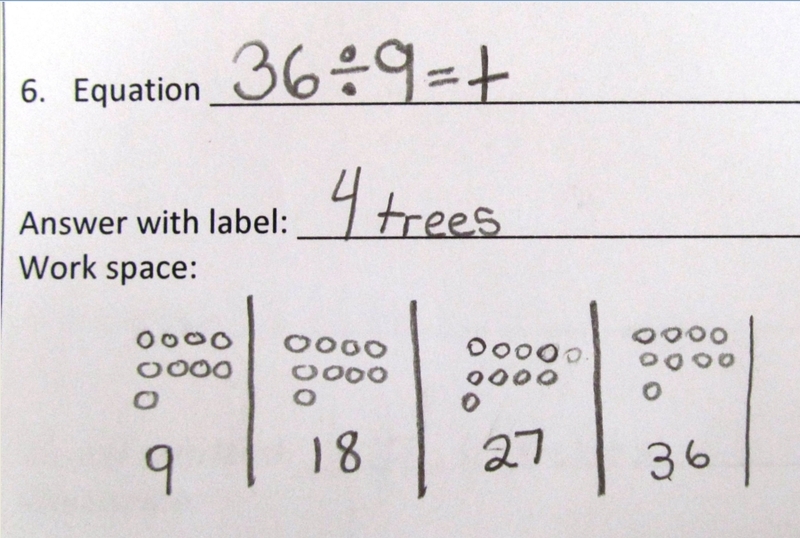 Here are a few examples from Math with Maples. Basing these problems on insects who live off maple leaves in varied ways increases engagement because students have innate curiosity about the natural wold. This student's equation shows that they have made a connection between the insect and Minecraft and that also builds a connection to the mathematics. The problems contained within this Powerpoint are mathematically simple in order to emphasis the process of creating the division problem itself from the information in the word problem. This care taken with this student model of a division problem indicates engagement with the math and the content. An added enrichment component embedded in this lesson is that students may start asking mathematical questions about science content, which is what it's all about! In addition, the note taking space on the side of the lesson study pages gives the children to ask other mathematical and science questions, such as this one about a particular insect named the Saddleback Prominent. It's a perfect tie in to our 3rd grade lessons on inherited traits vs. response to the environment! All insect data is based on information from the USDA/ USFS plant pest site. A space has also been provided to encourage students to take short, specific, scientific notes and to practice asking and writing meaningful questions about non-fiction content. Students work on their own or with a partner to solve these contextually based division problems. I challenge my strong readers with the Lobes on Leaves IP enrichment page, which uses more sophisticated sentence structure and includes additional information about the different insect species. 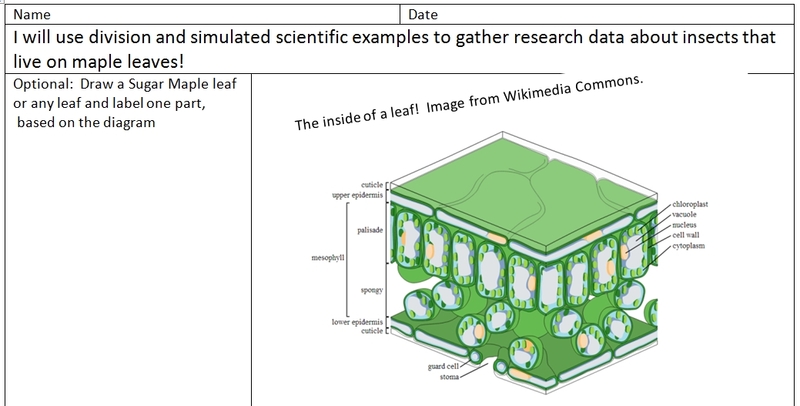 For my on-level, below-level or ELL students, I use this Lobes on Leaves IP on level page, which provides exposure to the science content without language that may confuse them or dilute their ability to approach the math. A strategy I use with the students when I confer with them is to have them reread the problem, identify the question they are solving for, and to underline relevant information and numbers. Alternative/ enrichment: What is the purpose of counting how many insects are on a leaf, set of leaves, or a tree?